Observation - Shore Crab - UK and Ireland. 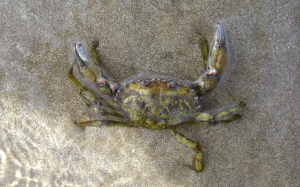 Description: This crab was in the shallows at low tide. It's shell was about 10 cm across. After the aggressive pose if buried itself in the sand. This crab was in the shallows at low tide. It's shell was about 10 cm across. After the aggressive pose if buried itself in the sand.